Apple's new iPhones are impressive and all, but I'd argue the company's new Watch Series 4 stole the show in Cupertino last week. 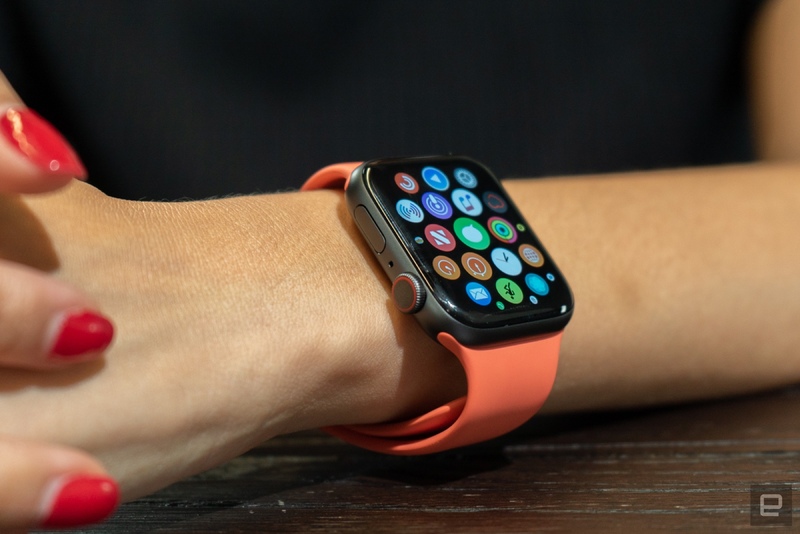 In addition to the first major redesign in the wearable's history, Apple crammed a host of improved health and fitness features into the Series 4's new and improved body. There's a lot to dig into and honestly, we're just not done testing the thing yet. As we work on our full review, though, there a few features and flourishes you should definitely keep in mind. You probably don't need me to tell you that Apple made its Watches bigger this year: we're looking at 40mm and 44mm bodies, up from the classic 38mm and 42mm. What has really stuck with me so far is that, despite wider frames and bigger, more enticing displays, the Series 4 feels more comfortable to wear for long periods of time than any earlier model. Your mileage may vary on that, but the fractions of a millimeter Apple shaved off the Watch's body have made a noticeable difference, for me. It certainly helps that the sensor hump on the Watch's back isn't as curvaceous as it used to be, so the wearable doesn't jut out from your wrist as much. It might seem like I'm getting a little worked up over a very minute change in case depth, but on a device like this, the little things matter. ...Is not a problem for the Apple Watch Series 4. That is, unless you want it to be. Both of Apple's new Watch designs feature screens that stretch further across the case's face, and since you can load certain watch faces with up to eight complications, it can be easy to squeeze a little *too much* information onto these displays. The thing is, it's just as easy to abstain: one of the first things I did was to remove half of the complications from the Watch's dense, default face, and I'd honestly recommend you do the same. Just because you can fit that much data onto a screen doesn't mean you should. Apple balanced the excess of these "modular" watch faces with some very pretty options that are a bit more spartan. The Fire watch face the company showed off at its recent launch event doesn't allow for any complications at all, and you can't even modify it to give you hour markers. And the Breathe face — which lets you pull up some calming exercises with a single tap — is similarly sparse. Long story short, it's not hard to make sure these big new displays aren't unnecessarily cluttered. Apple's virtual assistant tends to get a bum rap, but at least it's easier to talk to on the Series 4. In addition to holding down the Digital Crown or saying "Hey, Siri," you can now just raise the Watch to your mouth and start talking. If you're anything like me, this will quickly become the only way you talk to it — so far, the Watch has done a great job recognizing the motion and listening to my commands. Even better, if you're running iOS 12 (you have installed it, haven't you? ), Siri on the Watch can trigger any of the shortcut commands you've crafted on your phone. That's not to say Siri is massively better than it used to be — it still fumbles a lot when I'm speaking messages out loud for it to send — but talking to it at least feels more natural. More than ever, the Apple Watch is able to help you take care of yourself. In the event you'll ever take a nasty spill, the Watch will recognize the motion and check to see if you're OK — if you don't respond for a minute, it then calls emergency services. This sounds like one of those features that would be prone to false positives, but it absolutely hasn't been so far. A few nosedives into a couch didn't trigger the alert, and neither did a prolonged period where I just smacked the Watch around a lot. This speaks to the sophistication of Apple's fall detection model, but you know us — we're going to try and trigger the alert somehow, even if it involves kneepads and a helmet. And of course, the Watch can keep tabs on your heart. One of the Series 4s' biggest selling points is its ability to detect your heart rate and record electrocardiograms (ECGs). Too bad it's not ready yet. Apple says the feature will go live later this year, and I hope it doesn't take too long — after making such a big deal out of ECG readings during its recent keynote, the feature's absence here feels pretty conspicuous. Fine, fine, this technically a watchOS 5 feature, but I've been introduced to it on the Series 4 and I'm already sort of addicted. It does exactly what the name implies: once enabled, just hold down a big yellow button and gab away. 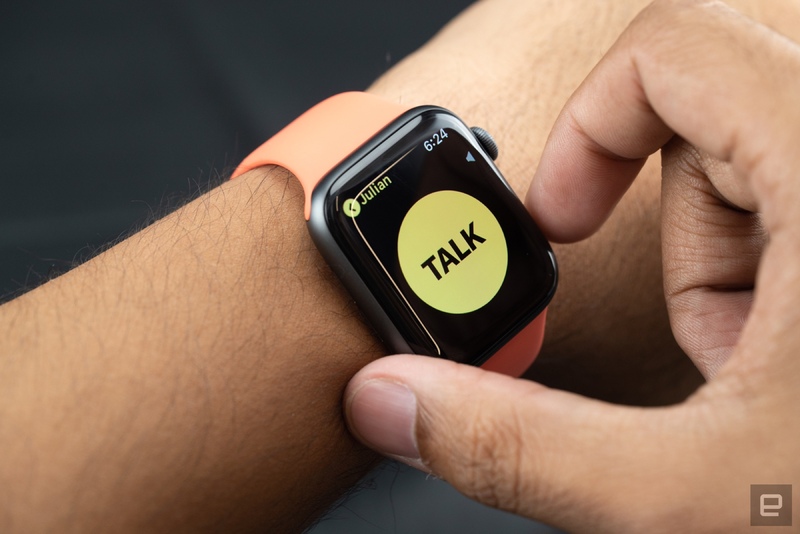 Assuming your network connection is good (or that you haven't wandered away from your phone), and you can have near-real-time conversations with your Watch-wearing friends. (Obviously, more in-depth chats would benefit more from a phone call or a FaceTime conversation.) I haven't been using the feature for very long at all, and I can already feel it becoming my preferred mode of communication for asking quick questions and checking on people throughout the day. For a device like the Apple Watch that's primarily meant for brief interactions, it feels right at home. I've really enjoyed my time with the Series 4, but there's still a lot of testing to do and plenty of questions to answer. 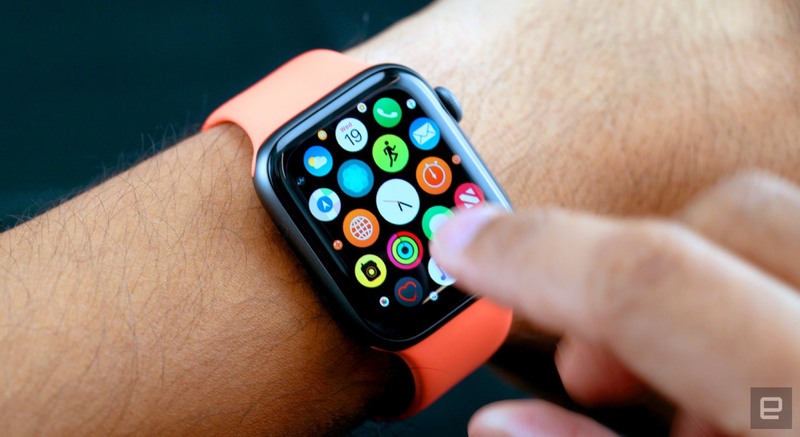 Will the Series 4 change the minds of people who shied away from smartwatches? Can the Watch's batteries keep up with these bigger screens? And will I grievously injure myself testing the Watch's fall tracking? You'll have to wait a little longer for the full review to find out.